Beer really has quite the history. It has left its mark on many societies since the dawn of man. Ancient Egyptian pharaohs drank it and so does the common working man the USA. After all, it is the one and only patriotic party starter! Truly it acts as a unifier of peoples across all walks of life, through all periods of human society. Wouldn’t it be great if you could harness the miraculous power of beer for your next costume party? You could be the great unifier, just like the famous beverage. But how on Earth could one possibly do that…? The time is now, friend! You could gain the near super powers of beer with just a simple outfit! 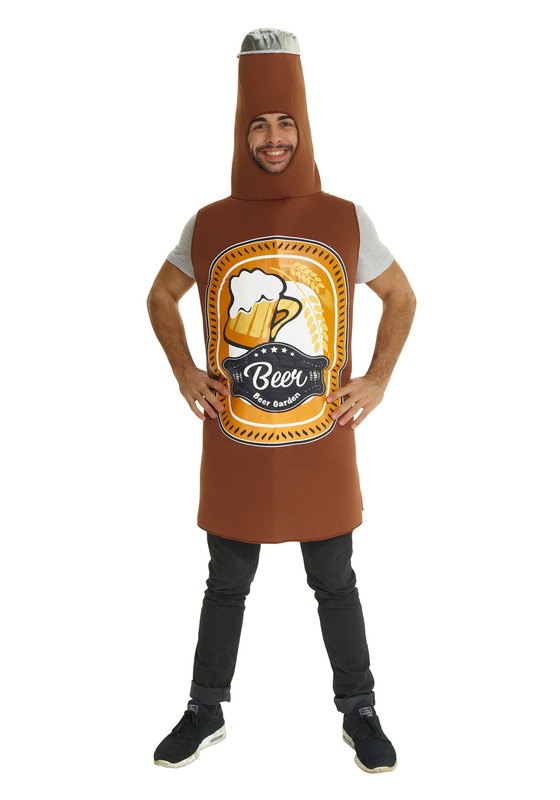 This beer bottle costume instantly transforms you into the miracle liquid that brings folks together and makes the world a better place. It comes with a polyfoam tunic that’s shaped like an ice cold bottle of brew, so you’ll look ready to mingle when you slip this simple outfit on over your normal clothes. The front has a friendly little stein printed on the front, along with a small image of wheat. The costume also makes for a great look with many group and couples costume ideas. You can gather up a group of six friends to wear this costume to become a “6-pack” or you can pair up with someone in one of our burger costumes to become the iconic beer and burger duo. Just remember that beer goes with anything, so any look you decide to pair with this beer costume will be a smash hit!